We are asking the Board members and CPS administrators to quickly rethink the $16 million cut made to full-day kindergarten in Chicago. Above: O. 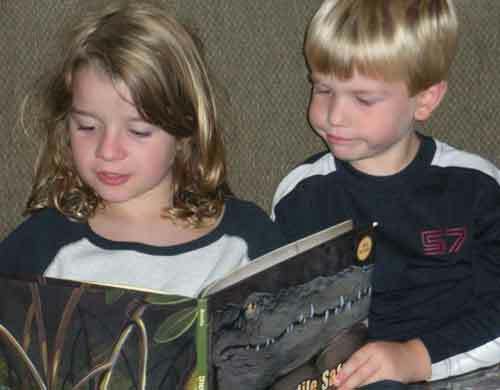 A. Thorp 3rd-grader Sam Schmidt and incoming kindergartener Josh Schmidt share a book together. “If kindergarten was just a blip you wouldn’t have time to make any friends,” incoming Thorp kindergartener Josh Schmidt said. “Just as soon as you start to make a friend your parents come.” Besides the socialization and learning through play that the children love, the kindergarteners at Thorp have enjoyed a kindergartener/third-grader writing partners exchange. Parents worry that the writing partners part of the curriculum and other special learning opportunities will be lost when their children have school for only two and a half hours a day. Substance photo by Sharon Schmidt.At O. A. Thorp Scholastic Academy, the end of full-day kindergarten is leaving nearly 90 families in a lurch this year. Parents, teachers, and principals across the city are dismayed that full-day kindergarten programs are being slashed to save a little money in the CPS budget. This savings is not worth the cost. Others from our school have eloquently illustrated the benefits of full-day kindergarten. The success of full-day kindergarten has been measured. It’s a winner. Thorp is an outstanding Magnet that serves a wide demographic and is focused on student success. We have strong parent support. We are very grateful for all the opportunities our students receive. We are proud to be a very strong Magnet school and our performance indicators indicate our commitment to academic rigor across the curriculum for all students. Having full day kindergarten is a something we feel supports our program and, if the possibility exists and funds are restored, we would be very appreciative. We are planning to do a great job in 2011 come what may!